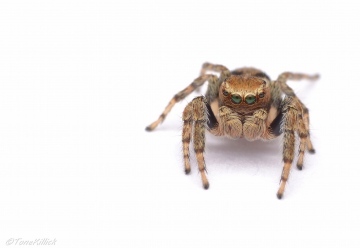 Most species of jumping spiders (Salticidae) are diurnal, heliophilous predators. During bad weather they retire to a silken retreat, which is also used for moulting, mating and egg-laying (Foelix, 1992). It is often implicit in descriptions of this behaviour that this retreat is also used during the night. The following observations show that this is not necessarily so. Individuals of Evarcha falcata were kept in plastic boxes (150x80x45 mm), the bottoms of which were covered with paper; wet cotton balls maintained humidity. The containers were sited 2 m from a large window, through which they received natural light/dark cycles but no direct sunlight. The spiders were fed adult Drosophila flies twice a week. During the day, the spiders moved freely in their containers. In the evening, they stopped walking around and rested at the top of the container. At sunset (about 10 p.m. CEST when these observations were made) they finally adopted their typical sleeping position: hanging suspended on a short thread with all eight legs adpressed to the body. They remained in this position even when the containers were shaken vigorously. This behaviour was never observed during daylight or before lights were switched off in the evening. It was maintained until sunrise (about 6 a.m.). In some specimens, the sleeping position could be induced almost immediately by darkening the room and, conversely, sometimes spiders could be awakened during the night by strong illumination. However, other specimens kept strictly to normal sleeping hours: sunset through to sunrise. These observations suggest different levels of regulation of the sleeping behaviour. This type of sleeping behaviour was never observed in Salticus scenicus or Euophrys lanigera maintained under the same conditions. The advantage of a free-hanging sleeping position for a spider such as E. falcata living on open vegetation seems clear: the spider becomes inaccessible to many types of potential predators. The synanthropic wall-living species S. scenicus and E. lanigera have no opportunity to use this behaviour: at night they withdraw to cracks and holes, in which they may build retreats. It would be interesting to find out if this type of sleeping behaviour occurs in other species of jumping spiders living on vegetation. Direct observation in the field would be difficult, given the inconspicuous appearance of a sleeping spider and its sensitivity to light. Foelix, R. E (1992) Biologie der Spinnen. Second Edition. Thieme, Stuttgart. Postscript: Since writing the above note, I have observed the same sleeping position in another Evarcha speciesâ€”E. arcuata. It will be interesting to find out how common this behaviour actually is. Also it occurs to me that this feature of our most common species of jumping spider may well have already been noted in an earlier reference which has escaped my notice.